Philadelphia, PA - Le Dîner en Blanc 2017 - Catering options include packages from three of Philly's top culinary names this year Feast Your Eyes Catering, 1732 Meats and Collective Creamery. Below are qustions and answers from Natanya Dibona (Diner en Blanc Phil Co-Host), Lynn Buono (Feast Your Eyes Catering) and Alex Jones (Collective Creamery). Q: Why Feast Your Eyes? 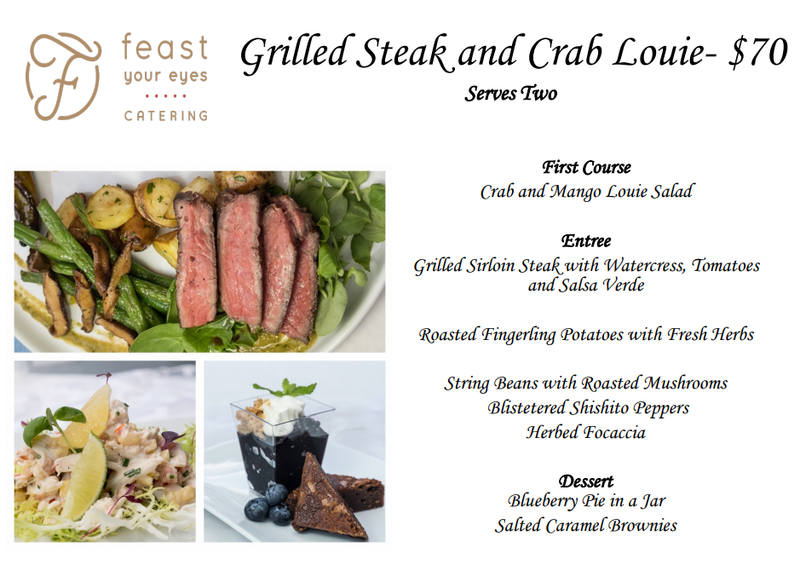 A: "I have been a big fan of Feast Yours Eyes catering since I worked with them on a gala I planned a few years ago. Not only is their food delicious and their service and attention to detail impeccable." Q: Tell us about other new partners? 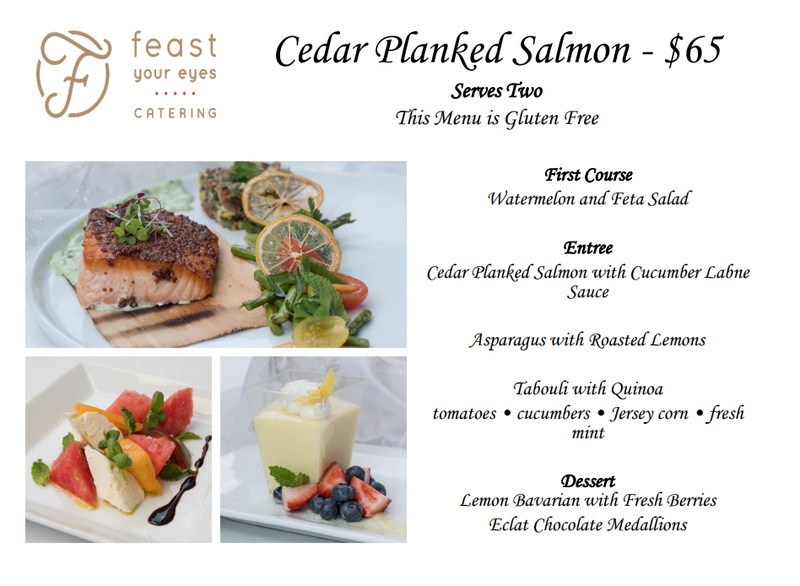 A: "We are so excited about the variety of the menus that Feast Your Eyes is offering this year- from panko crusted chicken with parmesan to cedar plank salmon and grilled sirloin steak, each meal is more delicious than the last. 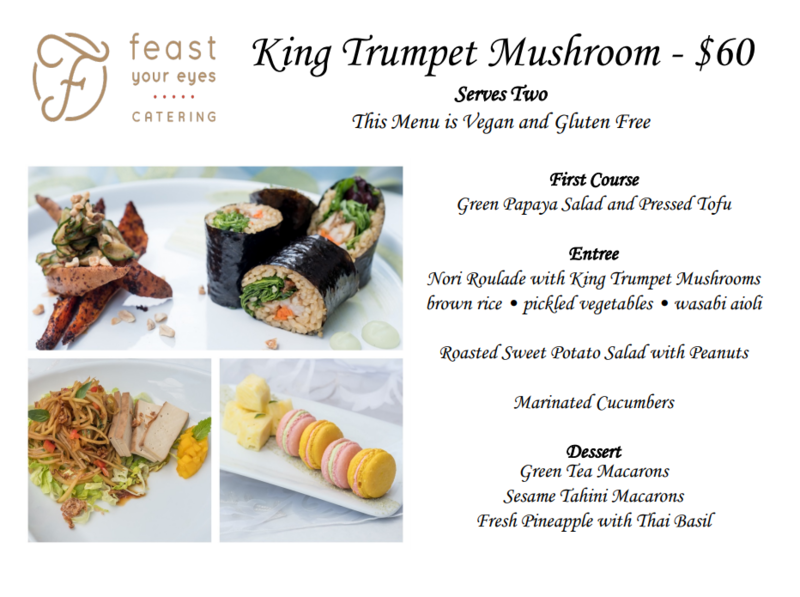 There is also a delicious vegan entrée and many and gluten free options." "We also know that a lot of our guests prefer to pack their own meals, but like to supplement with cheese and charcuterie boards. 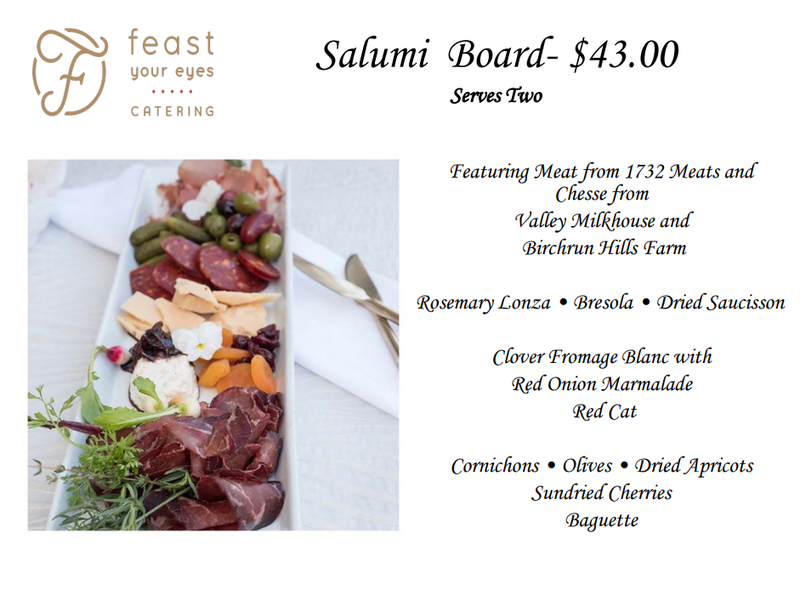 So, we have partnered with Collective Creamery and 1732 to supply cheese and charcuterie for the boards which will be prepared by Feast Your Eyes." "The cheeses produced by Sue Miller, Birchrun Hill Farms and Stefanie Angstadt, Valley Milkhouse are really incredible, so when they came together last fall to offer their cheeses through Collective Creamery, I was really intrigued. I have also been keenly following the praise for Ari Miller’s 1732 Meats with particular interest since in high school I lived in Lansdowne, just a few houses away from where they began their business." "Through this unique collaboration this year we are bringing together local producers who have an old world approach to their crafts to create a truly global menu." Feast Your Eyes, Inc. began in 1982. Today we have 150 full and part-time employees, including the sole owners, Lynn Buono and Skip Schwarzman, who are wife and husband. The company operated from a store front in South Philadelphia, until a move to North 2nd Street in 1988, in Northern Liberties. Q: Why did you want to partner with DEB for this year? A: "As caterers we’re in the special events business, which as you know is frequently described as being about events that take place uniquely, one time, unlike, say, restaurants. Well, there isn’t anything more “one time, right here, right now” than DEB, so it’s a perfect match." Order your package - Click Here! Q: What does it mean to you and your catering business? A: "It’s a fun and challenging extension of what we’ve been doing for a long time: delivering top shelf food when the logistics aren’t typical, when it’s not an established food service location. We’ve catered events for 10,000 at Eakins Oval and slightly more than that at Penn Park; we love developing the systems needed for serving great food in these settings." Q: Is this something new for your business? A: "As caterers, it’s not only about high profile events for us. It’s about quality, first of all, and then variety, and creativity. We have just as much fun throwing a private 6 person dinner for a client’s special occasion as serving bbq for thousands of Penn alumni, or even catering after a mass for the Pope! Diner en Blanc is another feather in our toques". Q: What was inspiration and goal when you set out to create menus? A: :Well, this is a party that has international overtones. It was started in Paris , but deserves a Philadelphia connection. So, serving 1752 Meats on our salumi board, along with Birchrun Hill Farm Cheeses, Valley Milk House cheeses and other area makers really shows the depth of Philly cuisine." "Our food this year is presented in biodegradable bamboo boxes in our efforts to always be as green a caterer as possible. We already have solar panels, bees and herbs on our roof and compost our organic waste." Q: What's next for your company? A: "We’re always looking to expand what Feast Your Eyes can do. Over the past decades we have twice moved into vacant factories and repurposed them into kitchens, and now our event venue in Kensington, Front & Palmer. Our latest project is pairing with the developers of Maken Studios to work on a unique venue called Fame. Besides having a panoramic view of Center City, and being large enough for 500, it’s part of their holistic development of the Harrowgate neighborhood; commercial, large and small residential, retail, and of course us. On the kitchen side, the world is our playpen! We love playing with different recipes, more and more of which are vegan and gluten-free. 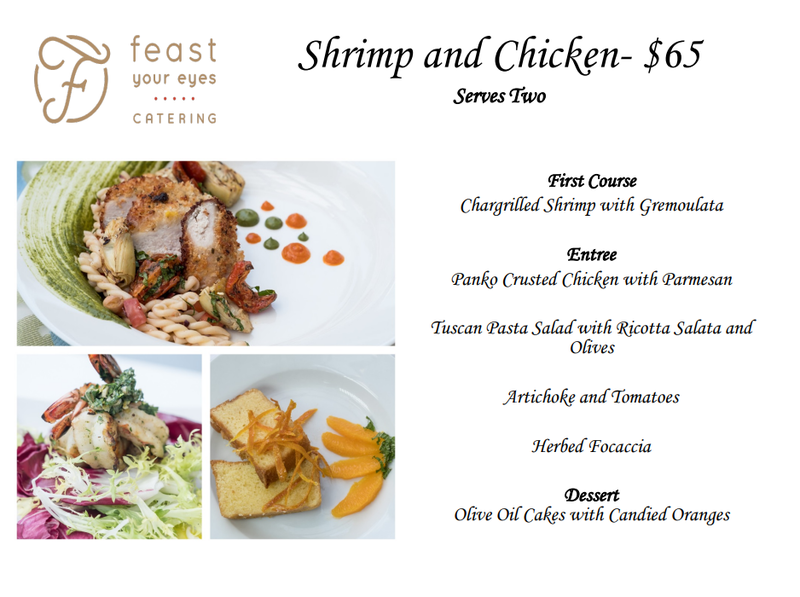 Feast Your Eyes firmly believes that culinary restrictions don’t have to limit your palate! We made sure to include both options in the Diner en Blanc selections." Collective Creamery is a biweekly cheese share subscription devoted to providing households with a regular supply of artisan cheeses that are handmade, traditional, and produced from the highest quality, healthiest milk. Collective Creamery is a collaboration between two cheesemakers in southeastern Pennsylvania: Sue Miller of Birchrun Hills Farm and Stefanie Angstadt of Valley Milkhouse. Empowered women, friends, devotees to the cause of evolving the American cheese culture, they are encouraged to work together to reach more families with their wholesome, artfully crafted cheeses and continue to develop the quality of U.S. artisan cheese. Q: How did you connect with DEB? A: "Our cheesemakers, Sue Miller of Birchrun Hills Farm and Stefanie Angstadt at Valley Milkhouse, have known Lynn Buono for years through Les Dames and in the local food scene. 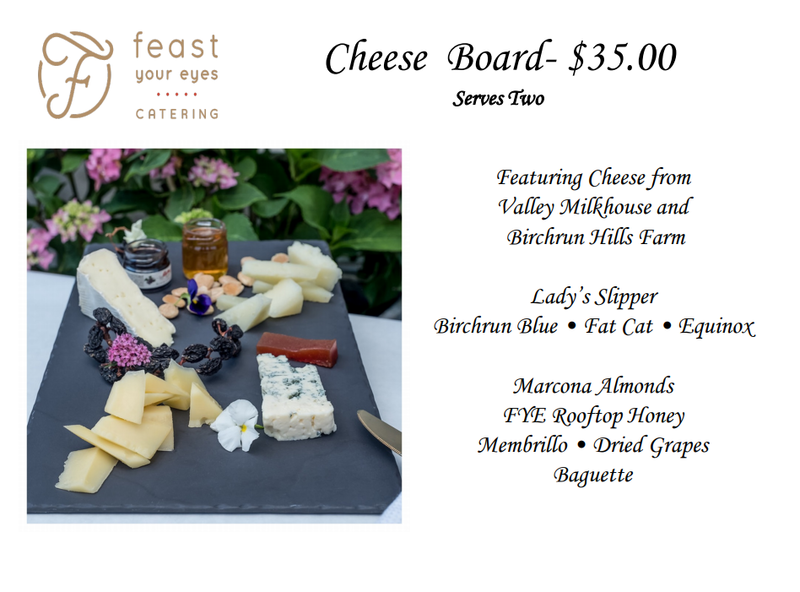 She reached out to include us as the supplier of the DEB cheese plate this year." Q: Why did it interest you and why did you want to get involved? A: "Collective Creamery's CSA-style cheese subscription is only one year old, so of course we were excited to be featured in such a high-volume, high-profile event — everyone has heard of DEB. And of course, we're excited to be working with Lynn and FYE more closely on this project and in such great company with our friend Ari from 1732 Meats! We hope we can reach some new artisan cheese lovers with our cheeses through working with DEB." Q: Any special meat/special item you are featuring we should point out? A: "Lynn and FYE have selected a really eclectic selection of our raw and pasteurized grassfed cow's milk cheeses, which are made by hand, locally, by our women cheesemakers. Since DEB is all about bringing a sort of French elegance to a spontaneous, fun event, our cheeses — which are made using traditional methods, some in the style of renowned French cheeses — fit perfectly with that idea"
Q: What should folks expect who have never had your food? A: "Our cheeses will transport you! They're the most nutritious cheeses you can be eating, since they're made with grassfed milk from happy, pasture-raised cows, and our women cheesemakers are real artists — they put love, care, and years of expertise into every wheel. Our cheeses really are edible works of art — the perfect start to a truly memorable DEB experience." Order Link to Catering Options for #DEBPHL17 - Click Here!